What is the simple harmonic motion? How to calculate the acceleration of an oscillating particle? 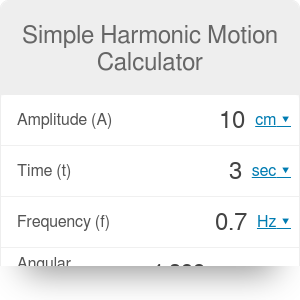 This simple harmonic motion calculator will help you find the displacement, velocity, and acceleration of an oscillating particle. All you need to do is determine the fundamental properties of the periodic motion - for example, its frequency and amplitude - and input them into the simple harmonic motion equations. If you're interested in how a harmonic wave propagates in space, check out the harmonic wave equation calculator instead. Simple harmonic motion is a type of oscillating motion. A particle in this kind of motion always moves along the same path, with an acceleration towards a fixed point. A great example for such a case can be the simple pendulum. A mass suspended on a string that is moved from its equilibrium position will move back and forth, always accelerating towards the equilibrium point. If we assume no energy loss, the pendulum will keep swinging forever. In the equilibrium point the kinetic energy is maximal. Let's analyze the example of a particle in simple harmonic motion. We want to find out what is the displacement, velocity, and acceleration at t = 1.4 s.
Determine the frequency of oscillations. Let's assume it's equal to f = 1 Hz. Calculate the angular frequency, using the the formula ω = 2πf = 2π * 5 = 6.288 rad/s. Decide on what is the amplitude of the oscillations. Let's take A = 15 mm. Of course, instead of calculating it manually, you can plug all of the values into this simple harmonic motion calculator. Simple Harmonic Motion Calculator can be embedded on your website to enrich the content you wrote and make it easier for your visitors to understand your message.